Only eight days before Microsoft's Windows 9 event in San Francisco and one Microsoft veteran has managed to get hold of screen captures believed to be the latest Windows 9 build, 9841. That person is Paul Thurrott of WinSuperSite, who reckons that the build is the current one though he admitted that it may also be the final Windows Technical Preview due to be presented next week. The new Start Menu is present - a combination of the old Windows 7 Start Menu and the current one on Windows 8.x start screen. Charms are still there but will only be activated when touching a display (be it on a tablet or a hybrid device). 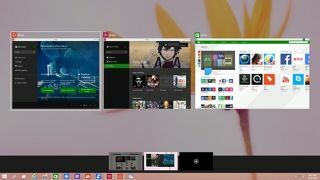 A new Task View button on the taskbar will allow you to switch between running apps and will see the introduction of virtual or custom desktops, something Linux and Mac users have had for ages. Microsoft also introduced a new feedback programme called the Windows Insider Preview Programme, which allows users to get more regular preview builds and provide frequent feedback to Microsoft. This allows for a more methodical management of user feedback based on top-level choices (major features) and applications (minor ones), thanks to better mechanisms (ability to send screenshots, add text and add more details to existing entries). Thurrott also confirmed that the Windows Technical Preview won't be available until next month but failed to provide with more details.